When you come to the end of your days, you will not measure your life based on success and failures. All of those will eventually blur together into a single memory called "life." What will give you solace is a life with nothing left undone. One that's been lived with relentless ambition, a heart on fire, and with no regrets. 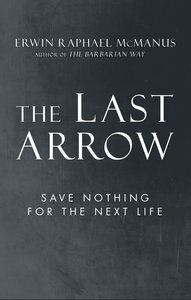 Customer Reviews For "The Last Arrow"
I thoroughly enjoyed reading this book. I have always loved the bible story this book is based around and this book approaches the story in a refreshing way. I have only recently heard of Erwin Mcmanus, but have since thoroughly enjoyed his preaching and this book. I would recommend his preaching and products to others.